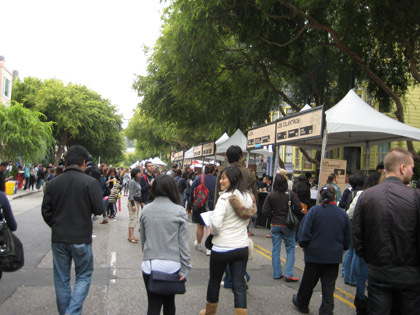 SF Street Food Festival | Ooh, my favorite! 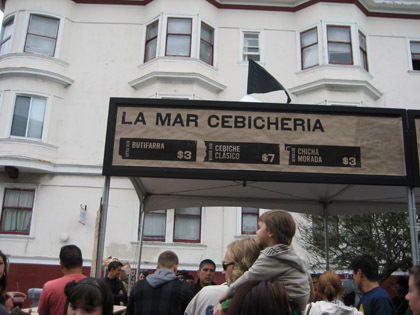 The second annual SF Street Food Festival was this past Saturday, and as promised we stopped by to sample some small bites from some of the city’s most popular restaurants and street food vendors. We had a really nice time. The weather was a little gloomy but it was a nice way to spend a lazy Saturday morning. Since we got there early (around 11:30) we were able to stroll around without too much hassle from the crowds. After about an hour it got a little crazy and it became really hard to navigate through the lines. Fortunately by that time we’d had our fill of snacks, so we hit the road and went up the street to Beretta for a relaxing lunch. It was fitting because Beretta had one of our favorite snacks and drinks. So good. 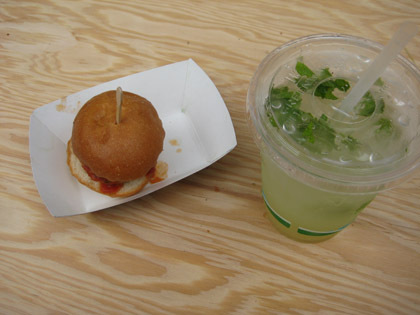 Tender and flavorful slider with the most amazing soda ever. I’m so inspired to start making my own summer spritzers now. Surprisingly Flour & Water had a nice little menu. Definitely what I would consider one of the city’s most overrated restaurants, they did step out with a nice housemand sausage and melon salad. This was our first stop to try to warm up a bit. 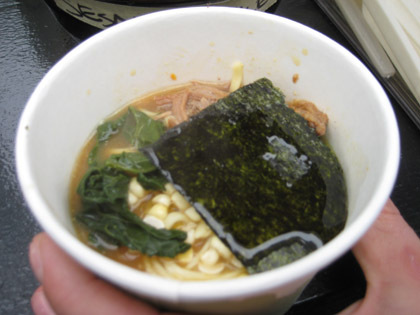 It was a nice broth with some tender pieces of pork but the noodles were not great. 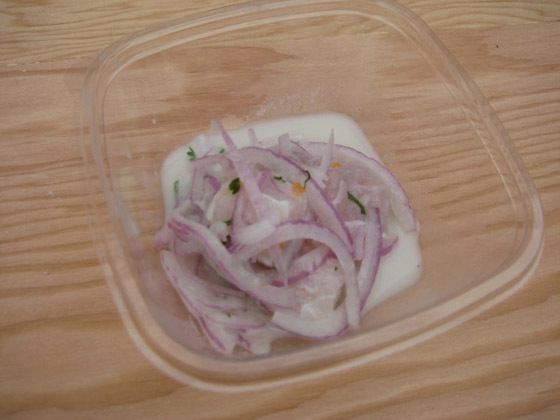 Overrated! Just didn’t get it. 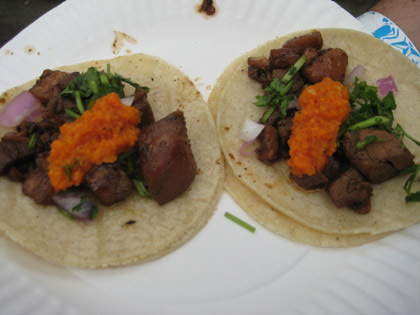 Korean flavors served on a corn tortilla. No thanks. Gimme one or the other, Mexican or Korean. 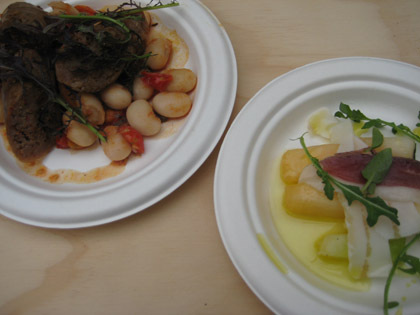 Perhaps one of my favorite things about the festival was that nearly every container and utensil was compostable – barely any plastic used at all. 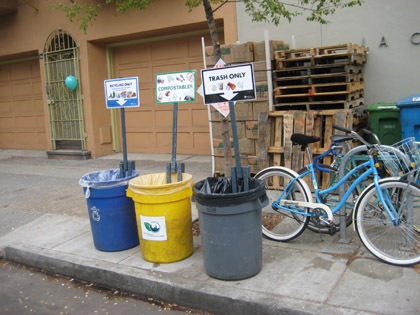 There were stations like the one above set-up throughout the area and many of them had people on hand to help make sure you were placing your garbage in the right container. So cool! I don’t understand Korean flavors served on a corn tortilla either. I really like Korean food and Mexican food but don’t think the fusion of the two is a great thing. I was so disappointed. They were definitely overhyped and not worth the long line. In the end I left craving a real taco and a plate of kimchi, rice, and bulgogi! SO JEALOUS!! wish they had had this when we are coming in october. Don’t worry, there’s always something going on here. There’ll be plenty for you to see and eat!